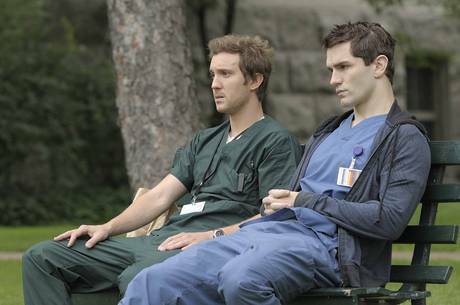 The chief strength of “Being Human” is right there in the title – it’s a show that finds humanity in the outlandish. Which SHOULD be storytelling 101, but the fact that it often feels like a rarity on genre shows makes it feel that much more special (and subsequently makes me even angrier at other scifi/fantasy fare currently available on the networks). For those coming in late: A vampire, a werewolf and a ghost live in the same house together, clinging to their makeshift family unit to feel less like monsters – while inflicting trauma on themselves and each other not because of their monstrous natures, but because they’re more human than they realize. Which means they often make staggeringly bad decisions. 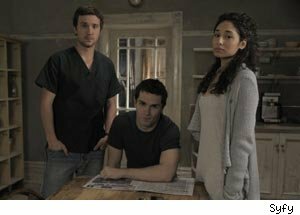 This isn’t the first show to use monsterism as a metaphor for more pedestrian human frailty, but it uses the trope to good effect – Aiden as vampire/addict; Josh as werewolf/sensitive-guy-with-primal-urges, and Sally as ghost/abandoned. But each of these basic ideas becomes a springboard for some really solid, emotionally complex narrative pathways that are completely relatable to the audience. The pacing of these early episodes is pretty clever, too – after the pilot establishes the premise, the episodes following split the group into their own, unrelated stories. But by episode 5, all the problems they’ve tried so hard to keep each other out of start bleeding into each other’s lives. The audience can see where these stories will likely intersect, even though the characters are (sometimes willfully) blind to it. And that’s the point. The three leads behave in recognizable ways even though their problems are technically larger than life. I can shake my head in frustration with Josh’s isolation strategy, but I can understand it, because anyone can recognize that irrational feeling that something’s so embarrassing t you don’t want to let anyone else see it. Everyone’s motivations make sense, because they originate in basic human behavior, stupid or counterproductive as it may sometimes be. Contrast that to, say, “V,” which seems to think just screaming “Motherhood!” and “Emotions!” counts as thematic motivation; or “The Cape,” which seems to have the lone idea of “Families are nice” as its emotional undercurrent. 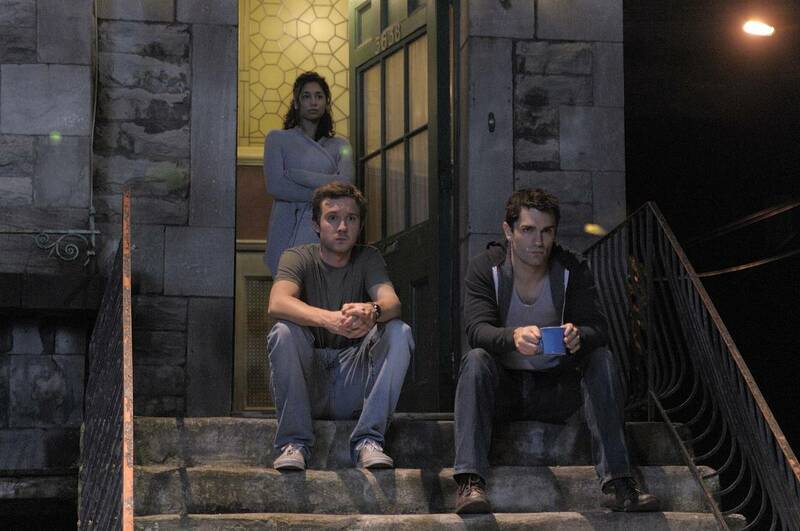 I’d also like to point out the other two selling points of “Being Human.” First: the production values are fantastic. It’s got a distinct visual style, and though it’s not an FX-heavy show, the ones it uses, including Josh’s werewolf transformation and Sally’s evaporations, look incredibly natural, especially for a basic-cable budget (again, making me wonder: what the hell are the green-screen costs on “V”?). Second, the performances are frequently hilarious. The actors are well cast and embody their roles comfortably, bringing warmth and humor to their day-to-day interactions. These three are likeable people with clear fondness for each other. Which makes the dramatic – and often dangerous – moments land when they inevitably come. I really can’t wait to see where the season ends up – there are a couple master-arcs going on involving vampire recruitment and Sally’s ex-fiance – but I’m even more interested in seeing how (or if) next season’s spate of network supernatural-workplace shows (every network seems to have at least two pilots ordered) attempt to find the humanity in the extraordinary. When you get the BBC version, try to get the original pilot. It aired a year before the first series, and because of scheduling conflicts has a different cast. (only Russell Tovey remains) I like the BBC show as is, but I really stopped caring mid second season. However, I go back and rematch that pilot a lot, because of all the potential those characters have especially with the note perfect performances. Interesting suggestion, I wonder if that’s available on the DVD set.